Regular hedge trimming undoubtedly enhances the beauty of every garden, but on the other hand irregular or incorrectly performed hedge trimming can ruin all your efforts to make the garden look neat. In addition, improper trimming or the usage of improper tools make your hedges look unhealthy and shapeless. In order to avoid unpleasant end results and enjoy the beauty of your garden, you’d better entrust us and we will take care of the overgrown hedges. 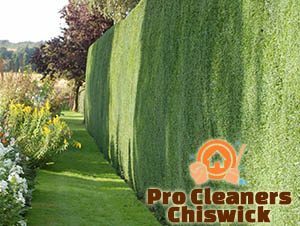 What we offer is a prompt, efficient hedge trimming service available for the area of W4 Chiswick. 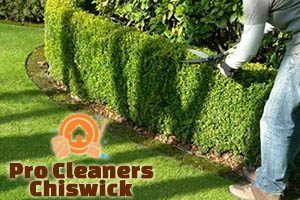 What we offer is a fast and efficient hedge trimming service delivered by professionals who know how to do their job right. They are equipped with powerful trimmers and their dexterity allows them to create beautiful shapes out of the overgrown hedges. We serve not only residential properties, but also Chiswick-based hotels, restaurants, schools and all kinds of properties where gardening maintenance is important. So, if you want to impress your guests and visitors, call us and we will perform the hedge trimming for you. With us, you can also take advantage of the full range of garden maintenance services including lawn mowing, tree pruning, seeding, weed and pest control and many more. Our gardeners will take care of the waste after the hedge trimming service is carried out and it will be disposed in an environmentally-friendly manner. In addition, you can take advantage of our same day service option that enables you to have your hedges in an ideal shape in a matter of hours. The service will not be a subject to hidden fees or minimum charges per visit. In order to make a booking with us, all you have to do is to discuss your availability and the availability of our gardening teams in W4 London with our operators. They will also provide you with a genuine price estimate and lead you through the simplified booking process.